Just a few days ago, there was this email circulating in the internet (well, at least in Kuala Belait), warning motorists about the behaviour of the owner and workers of this workshop that you may find across the KB Fire Station. From the original letter, many people added to this and shared their experiences with the workshop. This is not the first time the internet has been used to spread this kind of letter. Regardless of whether it is true or not, malicious or not, and libellous or not, there are other avenues to express your dissatisfaction. 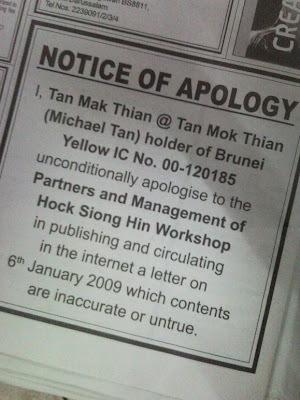 Choose the right way or you'll end up having to apologise publicly! Wow didn't expect this. Goes to show that the right course of action was to let the management itself know about his dissatisfaction as a customer. The legend of SDG lives on!